You bring your ideas & lots of enthusiasm. 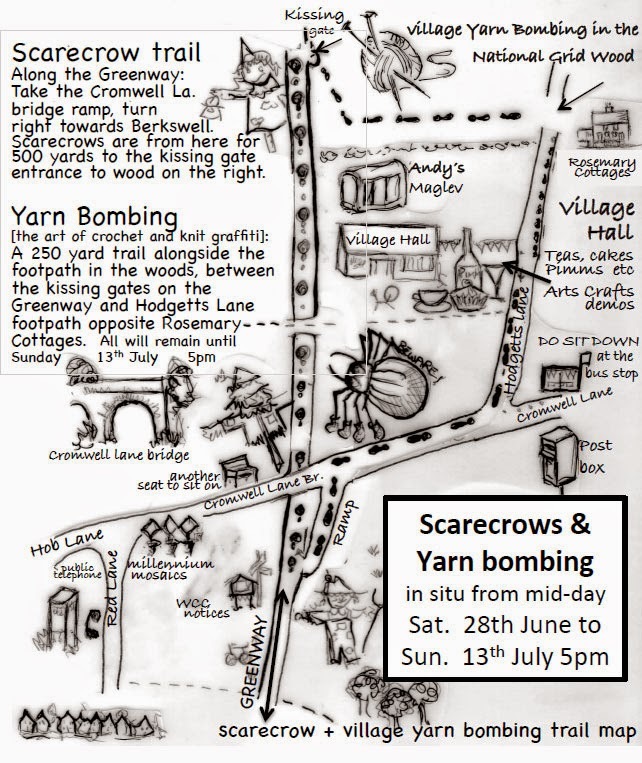 The Yarn Bombing Trail through the National Grid Wood, and the Scarecrow trail along the Greenway will remain in place until Sunday 13th July. The video is in high definition. If you have the technology at home, the video can be streamed and played on your HD TV. To view in HD you need to click on the Full Screen icon, and then click on the cog wheel and select a higher quality of 720p or 1080p. Viewing in HD is recommended, if you can. The shot below is looking along the Greenway, from the end of the Yarn Bombing Trail. I don't know if the inclusion of the story of Adam and Eve and the Garden of Eden was intended to have any particular significance. But I could not help but compare this wonderful scene to the Garden of Eden. The next Parish Council meeting will be on Tuesday 15 July at 7.30pm at Westwood Church (this is a change of date and venue). The agenda and draft minutes from the last meeting are on the Parish Council website, here: Agenda 15 July 2014 and here: Minutes 16 June 2014. Those details are similar to those that have been posted to residents by HS2. A great many hours of work went into the writing of the petition and all the research to get to the point of writing it. We will continue to do everything we can to mitigate the impact of HS2 on our community and recognise the dominant impact it has on the parish. Does anyone have any inspiring stories they would like to share? The Laterlife Challenge is a project that helps older people across the UK to become more active and interested in life. Each year they run an annual Challenge. The idea is to demonstrate to other retired people that there are opportunities to start new interests, join new clubs, make new friends, etc even when they are getting on in years. Have you done something new since you retired? Started a new hobby or interest, joined a club or planned an event or trip? Hilary Cox; Andy Gibbs; Terry Heyes; Judi Hibberd; Janet Hickinbottom; Bron Putnam; Mary Webb. Mary welcomed everyone especially Vaughan. Apologies had been received from Rona Taylor, Faith Ward and Diane Swindells. Public liability insurance: Terry clarified that BGRA insurance covered activities carried out by the Association, such as collection of subscriptions, delivery of Bugles etc. Events on other people's property needed the property owner to check their own insurance cover. Hence the Summer Jazz at Long Meadow Farm had needed additional insurance and BGRA has covered the cost of this. Collection of subscriptions: Much of Red Lane still needed to be covered and this would take place in September. Petitioning: Queries had not yet been answered regarding Cllr John Whitehouse acting as a witness and information from the parliamentary outreach group. Andy would be seeing Cllr Whitehouse the following week. Solar farm: The information about the grading of the land was still being pursued. The postbox had been vandalised but was now back in action. Pot holes in Hodgetts Lane had been circled so this should be monitored. Terry said there had been much activity in the last few months. Income was split between subscriptions and jazz ticket sales. There was a variety of expenditure items. Thanks were sent by Deirdre for the donation to the successful Made in Burton Green event. Total funds available stood at £3094. Expenditure for the Highgrove visit currently outweighed income but this would be balanced. With regard to subscriptions, about two thirds of the anticipated total had been collected and there remained much of Red Lane to be covered. A grant had been received for a World War One commemoration event in September. 4. HS2 Petitioning: what we do next? It was agreed that at a later stage it would be necessary to encourage residents to complete a form saying the BGRA represented their interests. It was anticipated that it would be claimed that all concerns would have been covered elsewhere so residents would not need to present evidence. Who would be invited to the Select Committee? Andy said it was most likely they would begin with the principal authority and work down to individuals. It was also noted that the BGRA petition was listed under Rona's name as an individual. Vaughan mentioned the changes to safeguarding. Mary had held a meeting with Diane and they had decided it was time to hold another "Retired of Burton Green" lunch on Friday August 1st. 28th September afternoon tea with World War 1 theme. A £356 grant had been obtained from Kenilworth Forum Special Events Fund. The application had suggested activities including food sampling, play equipment, posters from the Imperial War Museum, reproduction maps of the area from Warwiskshire arecord Office and afternoon tea. The list was not exhaustive and other suggestions were sought. All items purchased would be donated after the event to Kenilworth School, Burton Green School or the Village Hall. Pupils from Burton Green School would also contribute with a display and possibly some World War One songs. The history group would also prepare a display. The Village Hall had been booked. It had been agreed that up to 80 people could be seated for afternoon tea. Diane would be away for the event but would offer advice. Terry had some documentaries for wide screen TV if this could be made available. Mary had contacted the Herbert Art Gallery who had reported that they had a handling colllection and talk they could offer for £40. Mary would go back to them to see if they were prepared to provide this on the date chosen. There was a variety of display boards available. Mary was to contact Stan Kominsky to see whether he could paint two images e.g. of a nurse or land girl and a soldier so that children could have their photos taken putting their faces in appropriately placed cut out holes. The committee considered items marked in the Parish Plan for leadership by BGRA. Broadband: there seemed to be little progress on this matter as, being a small population, we were not considered a priority, even though access to cable was very close. Improved broadband was not anticipated until 2017. A number of approaches to the problem were considered and it was agreed further factual information needed to be sought. Alice said she would ask Alan if he would speak to the committee. Bron remarked that new sewage pipes were scheduled to be installed in parts of Cromwell Lane in September. Replacement of street light bulbs: Again, residents needed to report this problem when it arose and should be given the necessary contact details. Mobile library: there were differences of opinion about what was required and this would be explored further. Notice boards: subject to planning permission, Terry offered to have a board outside his property. As yet no-one had offered a suitable space for a notice board in Red Lane. Local business network: Jerry Marshall had already started to address this issue. Local produce: the committee felt the current situation of residents offering produce for sale at "the gate" did not need changing. 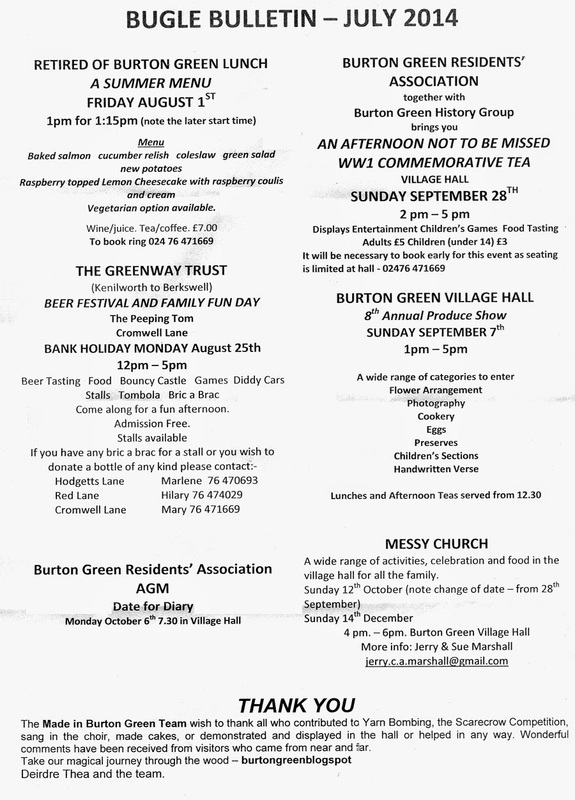 Local services: it was felt there was sufficient coverage of local directories such as the Look Local publication, even though that covered a wider area than Burton Green. The Bugle offered local businesses an opportunity to advertise. Community orchard: where could this be sited? Maybe there would be some space available when HS2 re-established the Greenway as this would be wider than the current Greenway. Information: Alice said Berkswell operated a Volunteer Service. Mary agreed to find out if this extended to Burton Green. A proposed Young People's Forum would be mentioned in the September Bugle to see how many were interested. Family days: The World War 1 commemoration event was an example of this. 7. Welcome pack- how to take this forward? The Welcome Pack had been prepared many years ago with the idea of delivering it to new residents. The Pack was very much out of date. A numbered map should be included along with contact details for the Parish Council, Village Hall, School and Residents' Association. The committee discussed the changes necessary and it was concluded that all suggested amendments and updated contacts including web links should be sent to Judi who would prepare a draft for the next meeting. There was no Village Hall report. Andy reported that the consultation on compensation came out that day so needed responses. Vaughan said as the recently elected Chair, he would be attending Residents' Association committee meetings to represent the Parish Council. He reported that he had attended a meeting of the response to the boundary review. With regard to the Parish Plan individual councillors would be following up actions. The Parish Council was watching for progress on any solar farm application. Vaughan felt it was more likely an application would not be submitted. The Parish Council was hoping to work with groups in Burton Green and would be arranging a meeting with the BGRA Chair and Vice Chair. When John Levett moves there would be a need for a new Neighbourhood Watch (NHW) Coordinator. Vaughan said he had much experience of NHW but did not have time to take this on. A new volunteer was needed. An advert for this has been placed in last two editions of Bugle but as yet no volunteer has come forward. The Le Van site was licensed for 20 vans so the site was currently being cleared. There had been some burning which was suspected to be of commercial waste. Residents also needed to be vigilant in case there was mud on the roads as a result of the heavy equipment being used. Any problems should be reported to Vaughan on 024 7669 4982. Increased aircraft noise was worrying some residents, especially in Hob Lane. Flight paths seemed to have been changed. Alice said the Balsall Common Bugle had published a map of the flight paths the previous year. Burton Green was not consulted with regard to this. Alice and any other residents affected were urged to note times and dates of offending flights and send to Vaughan. Vaughan asked for views on the future of the Red Lane playground. It was accepted that it was quite well used but was not ideally placed. Perhaps if the house building by Cala Homes took place, there would be scope for a new play area as Vaughan referred to "section 106" money which the builders might provide to the community for such a purpose. Meanwhile, it was recommended that the playground should be kept. Mary said she was hoping to prepare a Bugle bulletin to advertise the August 1st lunch and the WW1 commemorative event. Both the Greenway Trust and the Village Hall committee had been asked to contribute. Residents should be warned to be vigilant about spam emails. The next committee meeting would take place on September 16th at 7.30p.m.at the Village Hall.